Rainbow Magic | What is ML Reading? I did not introduce ML to the Rainbow Magic books on purpose. I knew she would learn about them from her peers. She did, and they can’t get enough of this series. The girls are requesting specific titles from the library, trading books, even devouring a book in one day. As a person who read every Nancy Drew book I could get my hands on, I can’t complain about these formulaic books. They built my reading confidence. A few years ago, I read a book from the Rainbow Magic series. I don’t remember which one, but felt like I should as a children’s librarian. 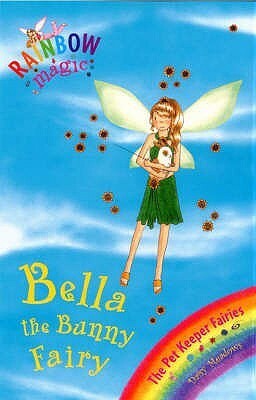 With 140 titles, you would think they would run out of fairy ideas soon. But a series already sporting titles Claudia the Accessories Fairy, Jade the Disco Fairy, and Scarlet the Garnet Fairy; and with Layla the Cotton Candy Fairy and Kayla the Pottery Fairy in the queue to be released in early 2014, most likely has more titles ready for publication. Any ideas for new fairies to add to their series? Maybe some cleaning fairies? Daisy the Dusting Fairy, Vera the Vacuum Fairy, Lisa the Laundry Fairy and Bernice the Bathroom Scrubbing Fairy.